Have a structured settlement or annuity but could really use the money now? Why wait when Rescue Capital can purchase all or part of your future payments for a cash lump sum. 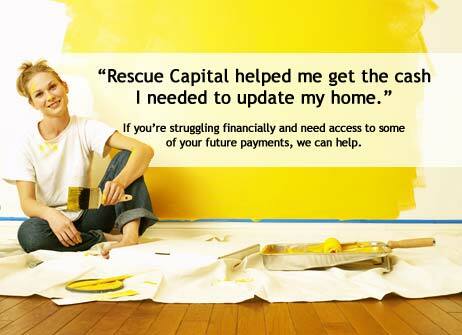 Rescue Capital's team of experts will work with you every step of the way to ensure the process goes smoothly. We know that each situation is unique, that's why we create custom programs to help you achieve your financial goals. So if you are finding that your periodic payments from your structured settlement or annuity are no longer working for you, give Rescue Capital a call at 866.688.3532 for a FREE, no-obligation quote or fill out our web form on the right. Structured Settlement and Annuity Payments are sources of a continuous finances but they are available either monthly, quarterly or yearly and in very small parts of the total amount. But at times you wish you could get the total amount in lump sum for an urgent cash need. Urgent cash needs arises for various purposes like starting a business, paying credit card loan, paying for medical bills, renovating the house, purchase a house or car etc. In such situation, would it not be profitable to sell your Structured Settlements or Annuity Payments to someone who can provide you with quick cash for them? Yes, Rescue Capital that is a customer-focused specialty financial services firm located in Philadelphia, PA offers cash for assets such as structured settlements, annuities, pending settlements and more. With the knowledge and experience of Maureen Healy, The Chief Operations Officer and the founding partner, Rescue capital has gained a high repute in the industry and in Philadelphia for providing the best financial advice and help. A structured settlement is a financial arrangement that allows court-awarded compensation to be paid in regular installments rather than in one lump sum and an annuity is a financial product that provides a series of payments over a specific period of time such as a lifetime. We at Rescue Capital understand your need for lump sum cash and are ready to purchase your illiquid assets. We have over 30 years of combined experience in the specialty finance services. We care about the well-being of our customers and provide solutions that promote their best interest. We treat every customer honestly, fairly and with respect. We take time to understand your needs and provide superior customer service by offering solutions that best fit your needs. Most people are unaware about the law regarding sell of structured settlements and annuity payments and hesitate to do so. But we would like to inform them that the sale of your structured settlement and annuity payments are allowed by State and Federal law. There are statutes in place to protect your best interest when you sell your future structured settlement payments. Also Internal Revenue Code section 5891, which was signed into law by President Bush in 2001, permits these transactions and you will not be in any trouble with your insurance company. It is not necessary to sell the complete settlement or payments. We provide you with many options to choose from including the amount or the timeframe of payments that you would like to sell. The benefits of selling your future payments to Rescue Capital are plenty. You are free to use the cash lump sum any way you want. It’s Your money, Your way. You can pay off debt, avoid foreclosure, buy a new home or car, or pay for school with that money. We usually take six to eight weeks to study your situation and provide you with the right solutions and right amount. Apart from providing cash for structured settlement and annuity payments, we offer lot more services like providing cash for your periodic payments and pending legal settlements. We provide cash advances for Cell Tower Leases, Lottery Payouts, Inheritance, Mortgage Notes, Royalties and for cases like Motor Vehicle Accidents, Work-related injuries, Slip and Fall and Medical Malpractice. Through Rescue Capital Broker program, we also offer to help many financial professionals, like an agent, broker, CPA, attorney, bank representative, financial planner or insurance professional find new opportunities for sales from their existing books of business. Our team helps them to meet their client’s financial goals through our various illiquid asset purchasing programs. We at Rescue Capital are committed to provide you with the best deal and we work with you at every step to ensure that the entire process goes smoothly. We use variety of financial tools for your help like budget calculator, credit card calculator, pay check calculator etc. Give us a call and get free advice and answer regarding selling illiquid assets such as structured settlement annuities, a divorce settlement, a single premium immediate annuity, life insurance policy, inheritance, royalties, cell tower leases, copyrights, patents, pensions or other periodic payments. Apart from onsite help, we have extended ourselves online. Our website contains information regarding how to sell your future periodic payments from structured settlement annuities, single premium immediate annuities and other illiquid assets. We also provide additional resources, whitepapers and personalized attention in order for our customers to make informed decisions. Hence do not wait for your money, call us and get the financial help you need. You can pay us for our services according to your convenience via check or direct money transfer. With our high quality services and products your expectations will be fulfilled beyond expectations. You can always trust us for any type of cash requirement from any type of illiquid assets. If you are finding that your periodic payments from your structured settlement or annuity are no longer working for you, give Rescue Capital a call at 866.688.3532 for a FREE, no-obligation quote or fill out our web form on our website or schedule a meeting with our team. For more information, you can logon to http://www.rescuecapital.com.